The 2014 Storms have removed large amounts of Sand and revealed the Fallen Trees and Tree Stumps of a Prehistoric Submerged Forest. 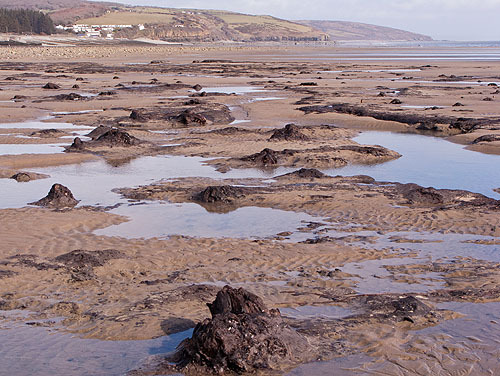 The remains of a " drowned forest" , submerged about 6,000yrs ago , can usually be seen here on low tides. The ancient forest extends up to one mile out to sea. Flints , tools ,acorns , hazelnuts , limpet shells , animal remains ,....have been found in the deposits. Abermawr , Lydstep Haven and at times - Freshwater West , Manorbier , Newport , Newgale , Whitesands and Wiseman's Bridge.